Meaningful football is a few months away which means there will still be a good bit of line movement. Because we are men of the people, we decided to dust off the old keyboards and see where our models sit at this point for your investment pleasure. Which of these games, if any, will be the Week 1 ‘Lock of the Week’ (reminder, we were 14-6-1 last season)? 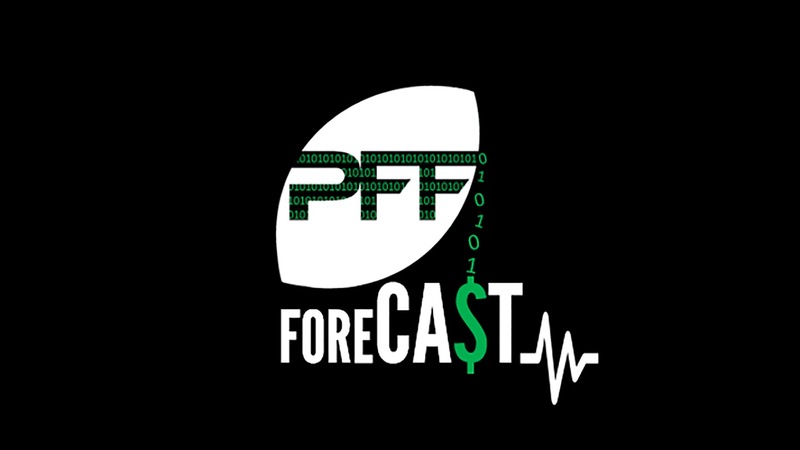 Give the latest episode of the PFF Forecast a listen to hear us discuss the options and subscribe to make sure you are ready to crush the 2018 season. Point (GC): Kirk Cousins ranked just 29th (of 39) quarterbacks in grade on ‘NFL Throws‘ and 27th (of 41) in grade from a clean pocket. While Cousins ended up as a fourth tier (of six tiers) quarterback last season, the Vikings pass defense was strong, allowing just a 81.4 passer rating from a clean pocket (second). Jimmy Garoppolo lived up to his divine lineage last season, posting the second-highest grade on ‘NFL Throws’ and ranking third in ball-location accuracy (QB ANNUAL, GET IT). Facing such a stiff defense we should expect to remember that a hallmark of Jesus has always been to overcome temptation and avoid the big mistake which should keep this one under 47. Counterpoint (EE): While this number is a bit high for one team boasting a top-five defense a season ago and another (or both?) possessing some uncertainty at the quarterback position, there are plenty of sample paths for which this could go over. For example, after failing to take a top-end cornerback at the top of the draft, how prepared is the 49ers defense for a passing game supporting cast (featuring Stefon Diggs and Adam Thielen) that in 2017 was one of the best we’ve seen in the PFF era? A lot of people appear down on the Seahawks, which is understandable given the departures of Richard Sherman, Sheldon Richardson, Jimmy Graham and Paul Richardson this offseason. That said, their quarterback Russell Wilson is like a morning cup of Joe in the Emerald City: pricey but worth it, having played his way into the top tier of quarterbacks in 2017 despite an offensive line that could likely get no worse moving forward. Against possible one-year wonder Case Keenum and a re-tooled Denver defense, we’re taking the better quarterback and the two points. Making the Case against a Seattle team with a top-tier QB who ranked fourth (of 41) in both big-time throw percentage and grade from a clean pocket (our most stable metric) is a tough one. The Seahawks have finally made a commitment to protecting Wilson, drafting generational tackle Rashaad Penny who is slated to be Germain Ifedi’s (59th – 48.6) right-hand man and slow down the Von Miller (second – 95.2) onslaught. Playing on the line of scrimmage should help Penny – as his ability to break contact given his high yards per carry when hit behind the line of scrimmage is well documented, but, buried within that little nugget is the fact that Penny was hit the shortest average distance behind the line of scrimmage of any drafted running back (it is advisable to draw a diagram to understand how these two points work together). As the great football LOU-minary 50 Cent said, “I got pennies for my thoughts, now I’m rich” – which is about what the running back position is worth. 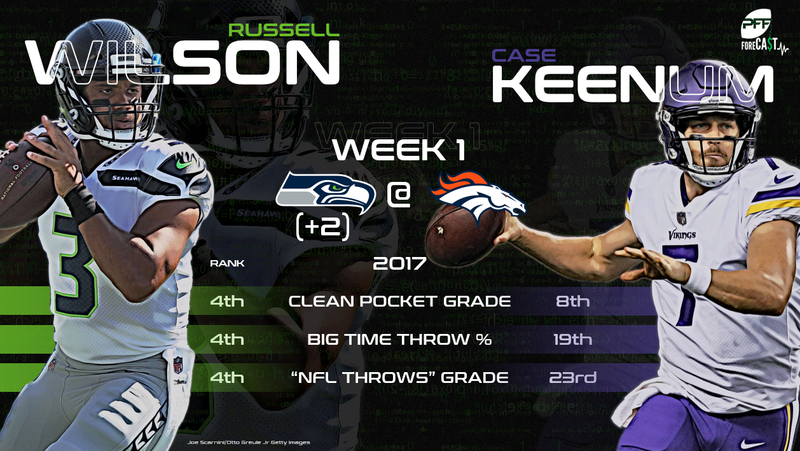 The Broncos don’t exactly have the most exciting offensive line in the league but Keenum showed last year that he can avoid the sack (second-best sack rate under pressure – 10.3 percent) while earning a top 10 grade from a clean pocket and making turnover-worthy plays at the seventh-lowest rate. Point (EE): The Patriots were installed as heavy favorites in Week 1 last year in Foxboro, only to lose outright to an upstart Kansas City team on their way to 5-0. I have a hard time believing they’ll come out that way again this season. Additionally, while Deshaun Watson’s rookie season was very encouraging, some of his accuracy numbers and supporting cast data would suggest that this number is a big short based on his statistical outlier of a seven-game rookie campaign. Counterpoint (GC): Tom Brady showed up to the Met Gala looking like a man ready to perform magic tricks throughout the 2018 season, and his first may need to be delaying Deshaun Watson’s recovery. Watson’s overall grade last season (75.1 – 30th) is skewed by a tumultuous start, but he earned top 10 game grades in three of his last four starts and ranked first in big-time throw for the season. There remains no one on this planet who can cover DeAndre Hopkins (90.6 – fourth) and the Watson-Hopkins combo generated a 133.4 passer rating on clean pocket throws last season, best among current QB-WR duos. Point (GC): How many minutes of offensive futility before the New York faithful turns angry? The over/under is set at 7.5. The good news for Giants fans is that the Jaguars allowed a passer rating of 103.5 to running backs last year (10th-highest). The bad news for everyone hoping that Saquon Barkley is going to turn the Giants around is that targeting a running back generates half the value (using expected points added) compared to targets to wide receivers and tight ends. The Jaguars will have the most valuable non-quarterback in the NFL in Jalen Ramsey (91.8 – third) on one side and A.J. Bouye (88.0 – 12th) on the other waiting to take advantage of any Eli Manning mistake. Manning wasn’t particularly excellent last season – he ranked 32nd in grade from a clean pocket and 33rd in grade when pressured. The return of Odell Beckham Jr. should certainly help but this is probably the stiffest competition he could possibly face in a return. Counterpoint (EE): After losing rock, paper, scissors to George over who would argue the OVER in this game, I’ve concluded that I’d rather also lose Russian Roulette than watch the actual outcome unfold (just kidding, but only barely). If running the football mattered, there would be a case that Orleans Darkwa (who averaged 4.4 yards per carry a season ago) and the revamped Giants running game might have some success against a Jaguars defense that, while second in points allowed, surrendered the seventh-worst yards per carry allowed in 2017. Nope. Point (EE): The hometown Cincinnati Bengals went over this number twice last season, and one of those games involved five quarters of Aaron Rodgers. While that’s certainly going to put me in the trend zone for as long as it takes Andrew Luck to recover from a shoulder injury, it just speaks to the sheer size of what we’re dealing with here. Furthermore, the Bengals’ defense is legitimately talented, with only three projected starters with PFF grades below 77.7 in 2017, and their offense is led by Andy Dalton, who might make the Colts bunch look similarly stout at home in Week 1. Counterpoint (GC): Even if Luck manages to upgrade from underhand tossing to throwing an actual football, he will face a Bengals defense that has a couple of elite players who should make points hard to come by for a Colts team that isn’t exactly flush with playmakers. William Jackson (89.2 – eighth) was the only cornerback to allow a sub-40.0 percent completion rate into his coverage last season (34.9 percent) and his 3.5 yards allowed per target was also tops at his position. Geno Atkins ranked second among interior defenders last season with a 91.5 grade and will get a chance to face a Colts interior that will need super-rook Quenton Nelson to play all three positions in order to have a prayer – this seems unlikely, but you never know. You may be wondering how these arguments support 47 or more points, they don’t.